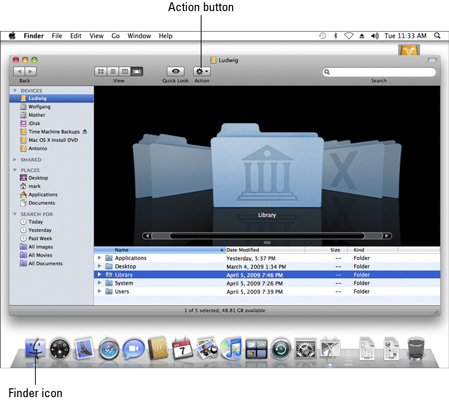 Mac Snow Leopard lets you create an exact duplicate of any item within the same folder. Cloning is often handy when you need a simple backup of the same file in the same folder or when you’re going to edit a document but you want to keep the original intact. Click the item you want to duplicate to select it and then choose File→Duplicate (or use the keyboard shortcut, Command+D). To distinguish the duplicate from the original, Mac OS X adds the word copy to the end of the duplicate’s icon name; additional copies have a number added to the name as well. Alternatively, drag-and-drop aficionados can hold down the Option key and drag the original item to another spot in the same window. When you release the button, the duplicate appears. Heck, if you prefer the Control key, you can hold it down while clicking the item and then choose Duplicate from the contextual menu that appears. Decisions, decisions. . . .
Oh, and don’t forget that Action button (it looks like a little gear with a downward-pointing arrow) on the Finder toolbar. You can also click the Action button and choose Duplicate from the pop-up menu. Click the Action button to find the Duplicate option. When you duplicate a folder, Mac OS X automatically duplicates all the contents of the folder as well. Remember that this could take some time if the folder contains a large number of small files (or a small number of large files).